Horse-riding has a long tradition in Croatia with indigenous breeds such as the Medimurje, Posavina, Lipizzaner, Hladnokrvnjak, and the Croatian Coldblood Horse. The latter is the most common. Many of these horses have been domesticated over hundreds of years and have proved useful on the farm as well as for recreation. Certainly the most elegant breed is found on the famed Lipizzaner stud farm in Dakovo, Slavonia. Founded in 1506, it is one of the oldest horse farms in Europe. Slavonia remains a popular spot for horse riding mainly because of the flat terrain, but there are also riding clubs throughout Istria and Dalmatia. The most colourful example of Croatian horsemanship is the famous Sinj Alka horse-riding competition that occurs each August in the Dalmatian town of Sinj. Perhaps galloping to a high ring and trying to put a lance through it is not what you're after? No problem. 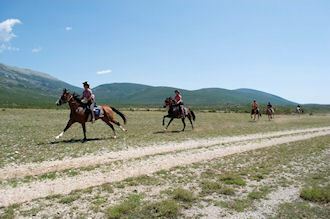 There are many opportunities to enjoy the Croatian countryside on horseback no matter your skill level. From full-service horse centers with riding schools and therapeutic programs to family-run stables there are a wide range of choices. For a complete list of horse-riding clubs, see the Croatian Equestrian Federation.